In this crackling alternate history thriller set in the years after World War II-the riveting sequel to The Darkest Hour-London detective John Rossett joins forces with his Nazi boss to save the commander's kidnapped daughter as the Germans race to make the first atomic bomb. With the end of the war, the victorious Germans now occupy a defeated Great Britain. In London, decorated detective John Henry Rossett, now reporting to the Nazi victors, lies in a hospital bed recovering from gunshot wounds. Desperate to avoid blame over the events that led to the shooting, his boss, Ernst Koehler, covers up the incident. But when Koehler's wife and daughter are kidnapped by American spies, the terrified German turns to the only man he trusts to help him-a shrewd cop who will do whatever is necessary to get the job done: John Rossett. Surviving his brush with death, Rossett agrees to save his friend's daughter. But in a chaotic new world ruled by treachery and betrayal, doing the right thing can get a man killed. Caught between the Nazi SS, the violent British resistance, and Americans with very uncertain loyalties, Rossett must secretly make his way out of London and find Ruth Hartz, a Jewish scientist working in Cambridge. Spared from death because of her intellect and expertise, she is forced to work on developing the atom bomb for Germany. Though she knows it could end any hope of freedom in Europe and maybe even the world, Ruth must finish the project-if she, too, wants to survive. Within this foggy moral atmosphere . . . Schumacher creates a believable yet depressing occupied England, frozen and snow-covered. . . . Believable alternate history laced with multiple gunfights, turncoat duplicity, and an ending sure to propel the British Lion back into action. --Kirkus Reviews"
Schumacher has done his historical research about Nazis, their sympathizers, and the Holocaust. He mixes those facts into a riveting story, creating an alternate history that will have readers trembling with the realistic possibilities. This is a must-read. --Blackfive.net"
The British Lion is . . . very good. . . . [It] definitely does both the thriller and alternate history genre proud. . . . Tony Schumacher is writing award-winning level fiction here and I would love to see him continue to do it for a long time. 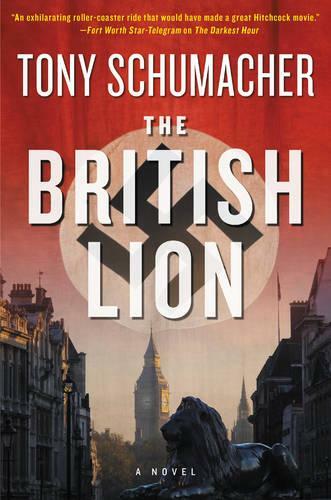 --Amazingstoriesmag.com"
Praise for The British Lion: Schumacher has done his historical research about Nazis, their sympathizers, and the Holocaust. He mixes those facts into a riveting story, creating an alternate history that will have readers trembling with the realistic possibilities. This is a must-read. --Blackfive.net"
An extraordinary and exciting tour-de-force [and] breathtakingly imagined Immaculate research and acute observation are allied to a dynamic cast of characters A riveting, remarkable novel which makes one hope there is more to come. --Lancashire Evening Post"